Our olive harvest takes off! Olives change color during ripening. Grape harvest fatigue behind us, and with predicted days of clear skies, the equally intense olive harvest starts end November/early December; Douro Valley tradition and when we are convinced at Quinta do Tedo of the balance between spice and ripeness in our fruit. Like our Porto and Douro DOC wines, Quinta do Tedo’s extra virgin olive oil is a blend of varieties - principally cordovil, verdeal, carrasquenha and moleirinha. Be it our olive oil, Porto and Douro DOC red wines, the inherent complexity, thanks to a blend of varieties, is what we believe in at Quinta do Tedo. Olive trees a la go-go! Our 800 olive trees - between 50 and 100 years old - are “survivors” – drought tolerant and so hardy. Planted on rugged, arid, steep slopes, to be present during the picking is impressive; how the fruit is harvested with nets propped underneath to prevent the prized olives from heading down to our Tedo river. Long days with strong and long wooden “beaters” in hand, our workers are proud and concentrated as they work, climbing on heavy branches and scrambling to reap the bounty; time is of the essence. Fact: there are no olive trees that ripen to only green olives! The riper the olive the darker the color, be it a grass green olive with hints of mauve to deeper purple tones with ripening; to a dark green; to a dark purple-almost-turned-black color, depending on the variety. The riper the harvested olive the more extracted olive oil during pressing, the greener the harvested olive the spicier and greener will be the olive oil with reduced quantity. At Quinta do Tedo we are not looking for a spicy piquant olive oil, but one that complements our Portuguese cuisine, known for full flavor, and asking for another bite. Our customers love our olive oil for an intense fruity yet mellow spice, a perfect bitterness and a long finish (length in the mouth is similar to descriptors for wine!). The beginning of the ripening process. Curiously, when the grape harvest starts, usually in September, the olive fruit starts to “pop” in color, almost a reminder to not be forgotten when we are so consumed with the grape harvest. 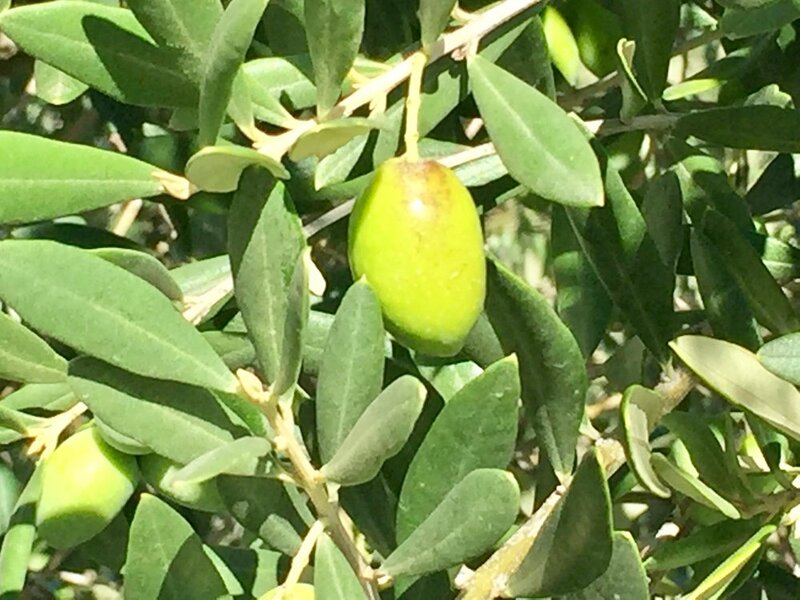 During the harvest, with a couple of rains, the olives’ growth in size takes off, and the subsequent ripening is a beauty to watch. As you can read, I am passionate about our olives. Be it the blue sky or whatever, love the contrast of the green olives not even starting to ripen earlier in the year! Thank you, Hans Johansson for the photo! The upright, proud and happy rooster is a common sight in Portugal – in the form of colorfully painted ceramics of all sizes, on towels and aprons, even as a tatoo! The legend associated with the emblematic bird is quite a story. 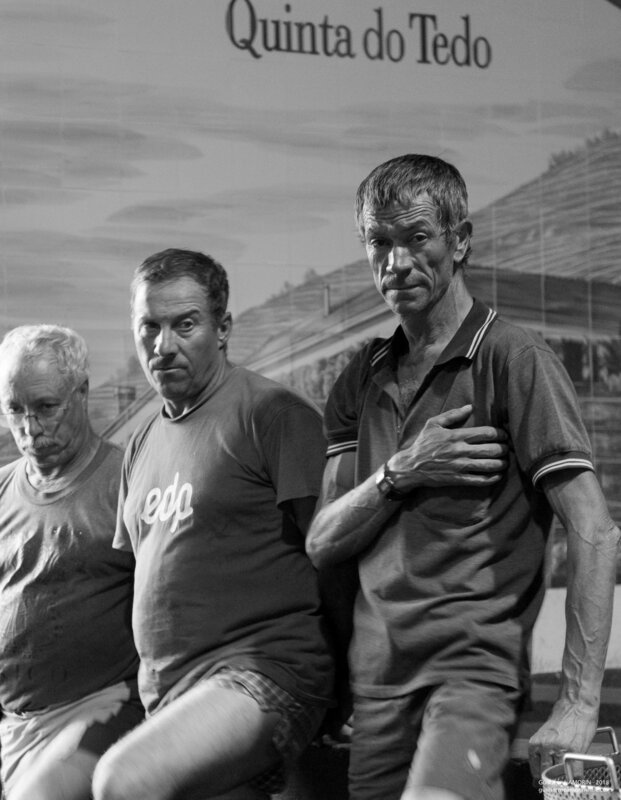 Taking place in Northern Portugal’s Barcelos some 700 years ago, a pilgrim walking the Caminho de Santiago do Campostela, was accused of stealing and sentenced to the gallows. He pleaded innocent but accepted his fate, and told the judge that if the rooster, on the. menu to roasted for a banquet the same time of the hanging, got up and crowed, then the pilgrim was innocent. Sure enough that is exactly what happened, as the man was being hanged, a roasted rooster appeared, got up on the table and crowed – proof of a farcical sentencing. A rush was made to see if the pilgrim was still alive, who miraculously had been saved due to a faulty knot around his neck. There are various versions, the above is shortened and my favorite. Portugal’s rooster embodies honesty, integrity, trust and honour and most importantly the Portuguese love for life. Visit Barcelos – a city known for handicrafts, that boasts a Thursday outdoor market in its very spacious square (with a multitude of rooster souvenirs to buy) and the ceramic olearia museum is a treat – with many caricatures of daily agrarian life, colorfully painted and made out of clay. Proudly standing Portugal’s emblematic rooster! Merci, Hans Johansson pour la photo! Le coq debout et joyeux est un symbole familier au Portugal – en céramiques de toutes tailles aux couleurs vives, sur des serviettes et des tabliers et même en tatouage ! Synonyme de Portugal, la légende liée à l’oiseau est aussi insolite que le symbole. Il y a environ 700 ans à Barcelos au nord du Portugal, un pélerin qui marchait sur le chemin de Saint Jacques de Compostelle fut accusé de vol et condamné à la potence. Il plaida son innocence et accepta son sort, mais le juge dit que si le coq, qui serait rôti et servi sur un plat pour un banquet au même moment que la pendaison, se levait et chantait, le pélerin serait ainsi déclaré innocent. Pour sûr c’est exactement ce qu’il arriva, et pendant que l’homme se faisait pendre, un coq rôti apparut, se leva sur la table et se mit à chanter – preuve d’une condamnation grotesque. Une bousculade eut lieu pour vérifier si le pélerin était encore vivant, ayant été miraculeusement sauvé grâce au noeud défectueux autour de son cou. Il en existe plusieurs versions, raccourcie celle ci-dessus est ma préférée. Le coq du Portugal incarne l’honnêteté, l’intégrité, la confiance et l’honneur et de façon plus importante l’amour des Portugais pour la vie. Visitez Barcelos – une ville réputée pour son artisanat qui accueille un marché en plein air chaque jeudi sur sa vaste place principale (avec une multitude de souvenirs de ce coq à acheter) et le musée de la céramique olearia, garni de nombreuses caricatures en argile de la vie quotidienne agricole, aux couleurs vives, est un régal. 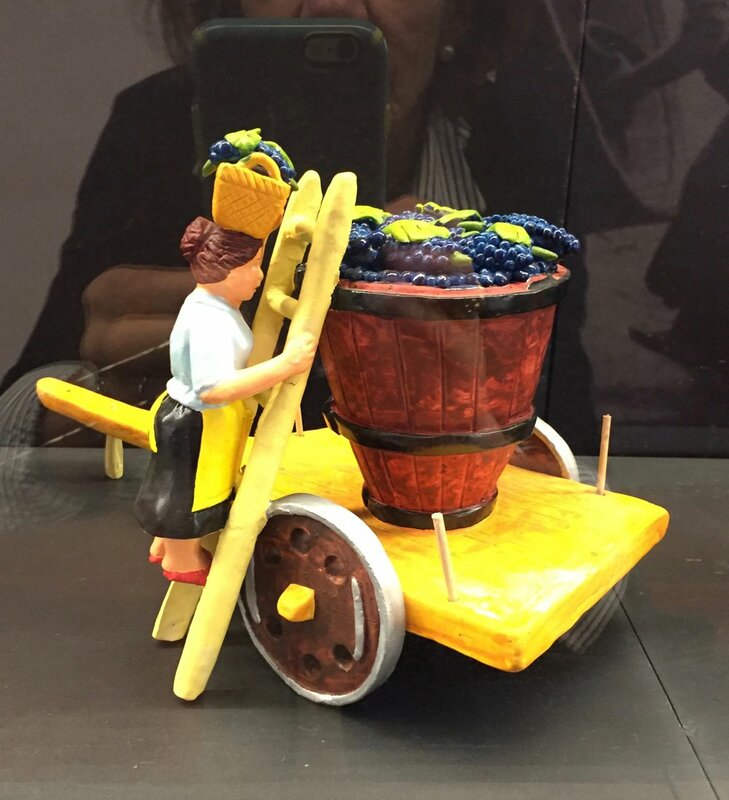 Profitez des modèles en céramique représentant la vie agricole au Portugal à la taille de votre poing vu au musée. Toujours fier, le coq portugais! Harvest time is an ongoing buzz of activity. The culmination of a year’s work in the vineyards, this year’s later start date 6 September had a consequently later end date 25 September. The first parcels were picked for our Porto Rose’ and Douro DOC red wines, others lacked higher sugar levels for other Porto production, so there were some days when we didn’t pick, very unusual! We picked about 30% less grapes, as is true for most of Douro Valley. This year has been a challenge, a combination of rain until July (instead of March), and cold weather mixed with some burning days. Since we practice organic viticulture, we use a minimum of certified organic treatments. Certain parcels, due to the multitude of microclimates on our property, suffered from either uneven ripeness, mildew and/or powder mildew. This is a first for us, to have this problem. As climate change is no longer a trendy word, for viticulture there are ramifications and we are not spared. 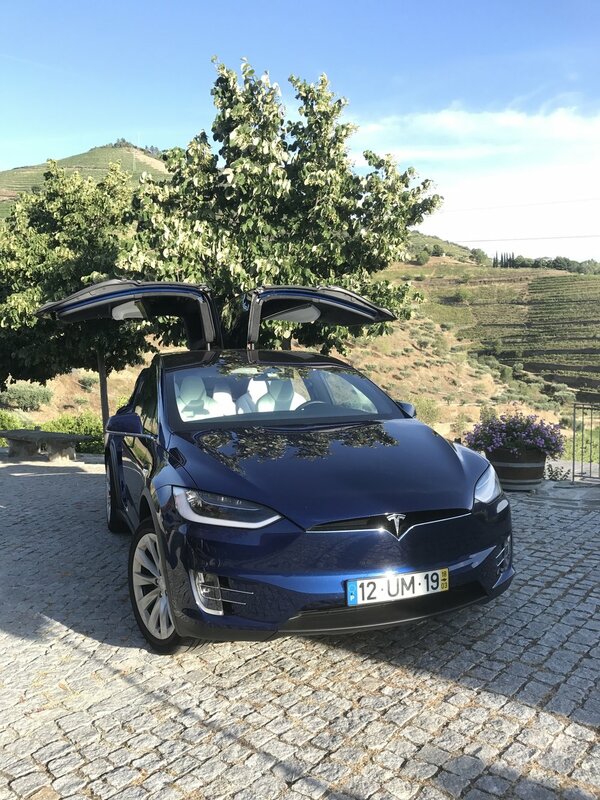 Still we harvested many parcels with promising fruit under the beautiful Douro Valley sun. Not only in the vineyards and winery is a lot happening, also in our Tasting Room and Bistro Terrace, as Enotourism (wine tourism) is here to stay. Douro Valley has become a wine lover’s day-trip destination from Oporto, in addition to those who stay for an average 3 days. I am so proud of our hard working tour guides, both our multilingual professional Portuguese tour guides, and the 3 French interns working in our Tasting Room during the season. Bistro Terrace’s Tapas do Tedo theme at lunch provided small plate specialties to match our Portos and Wines, as well as sustenance and relax before or after a tour and tasting, and our customers seemed overall very pleased. 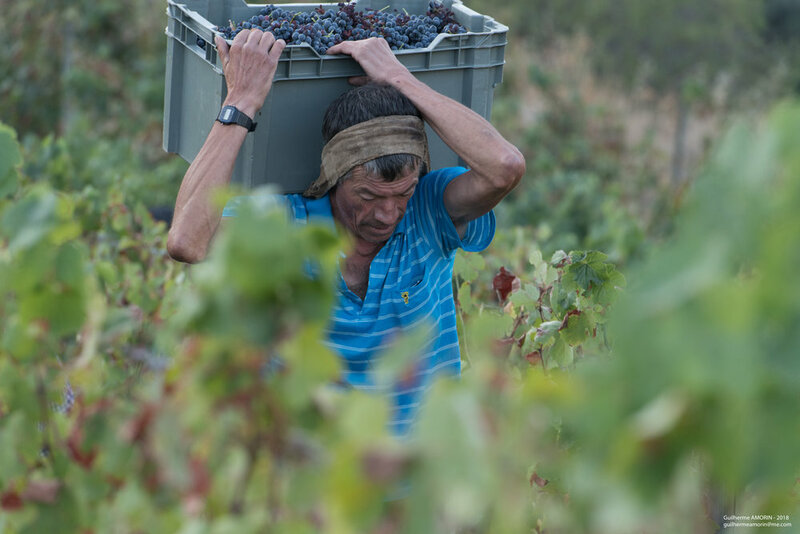 Photos always capture the harvest buzz, and here for your enjoyment…..
Femaie dexterious hands make for selective and efficient picking. Male strength allows for carrying down the slopes full crates. Unloading and sorting begins, note the 1 white grape cluster! Pressing of grapes that afterwards is pumpe to the “lagars”, juice, skins and pits together! 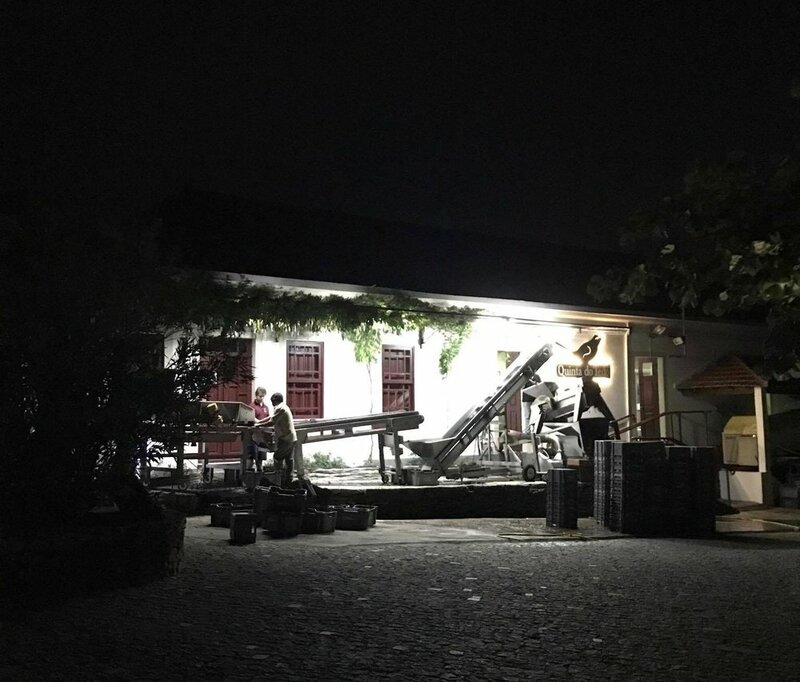 Our vineyard workers, after a long day of picking, foot tread 3 hours for approximately 3 days until fortification = birth of a new Porto! Tired, proud and committed, thank you. There is also merriment in the lagars - together with B and B guests, tour guide Rita and cook Adelaide, to add allegria to the adrenaline-charged harvest time. Work continues….time is of the essence! At the end of the day…remember “Purple Feet = Promising Porto”!